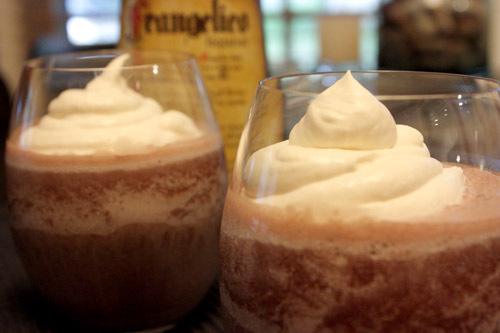 This delectable, icy concoction comes from the February 2002 issue of Living magazine. Apparently, it had been waiting in the file for its debut in my kitchen for six and a half long years. I just checked online, and this particular recipe isn’t there. There’s a note on the page from the magazine which reads "inspired by the frozen hot chocolate at Serendipity." So, I suppose my version is a second generation inspiration. 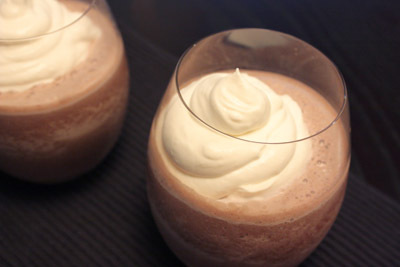 My changes to the magazine’s version included decreasing the amount of heavy cream, increasing the amount of milk, and then making it a grown-up chocolate malted by adding Frangelico. 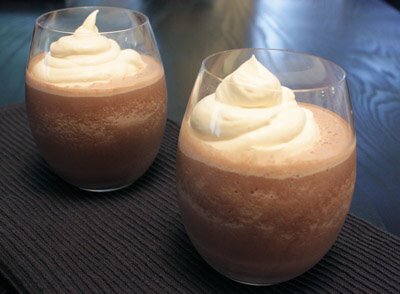 It was a delicious, chocolaty, hazelnutty, glass of frozen goodness with whipped cream on top. I almost immediately got a brain freeze. That’s ok though, I deserved it. I should have realized that this should have been savored for awhile. Our glasses became empty far too soon, and so did the blender pitcher. Be sure to procure at least double the quantities listed above so as to remedy this problem when it occurs. 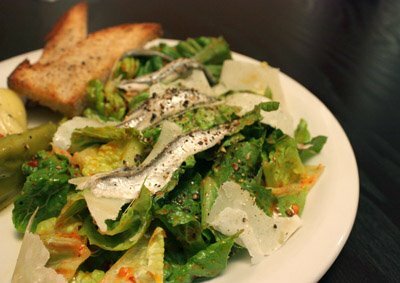 The concept of the romesco caesar salad was stolen from Fino. I had such a salad there a couple of years ago, but it appears they no longer serve it. 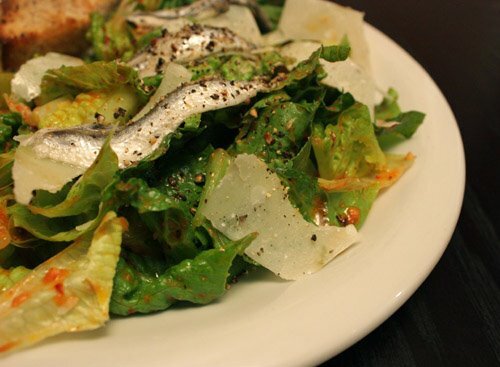 Romaine lettuce with a romesco-like dressing was topped with lovely, whole anchovy fillets. I served the salad with a few goat cheese stuffed peppers on the side. I used fresh caribe and hatch peppers. Hatch chile season started last weekend, and I plan to use a lot more of those in the next few weeks. For this meal, I just grabbed a few of the smallest ones in the bin. 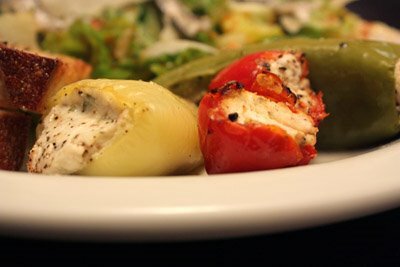 I also stuffed a few marinated peppadew peppers to add a little flavor and color variety. I used four ounces of goat cheese and one minced clove of garlic and stirred those together with salt and pepper. 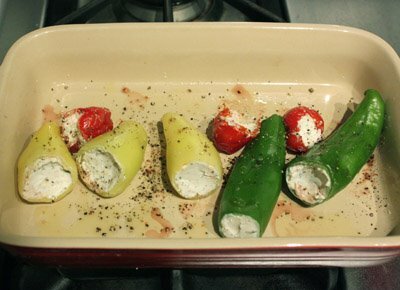 The cheese was stuffed into eight hulled peppers. The peppers were splashed with a small bit of red wine vinegar and olive oil, sprinkled with sea salt and pepper, and they baked in a 400 degree oven for about 20 minutes. Romesco caesar, rustic wheat crostini, and goat cheese stuffed peppers were fantastic together. I’ve mentioned before that Kurt rarely comments on a meal without being questioned or prompted in some way. Well, this was one of those rare occasions on which he expressed his delight all of his own volition. He proclaimed the salad good eatin’, was very pleased with the shiny anchovy fillets, and quite liked the stuffed peppers. I too was very happy with the meal. The peppers were a burst of great flavor, and each type had its own unique appeal. The yellow caribes were especially good. The salad was as delicious as I remember it from Fino. Maybe next time I’ll use manchego; there’s always an excuse for more tinkering. 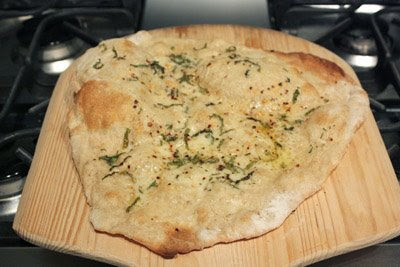 Making pizza dough may seem time consuming, but the time involved is mostly in waiting for it to rise. I’ve made the pizza dough from The New Basics so many times that I’ve memorized the technique. 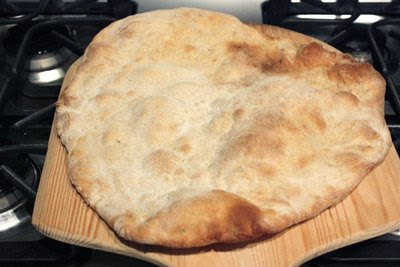 Warm water, instant yeast, whole wheat flour, and unbleached all purpose flour are combined in a bowl. Olive oil, salt, pepper, and more flour are added. Adding pepper is my own touch. I like pepper, and the specks in the dough are pretty. Stir until dough comes together, then turn out onto a floured surface and knead until smooth. 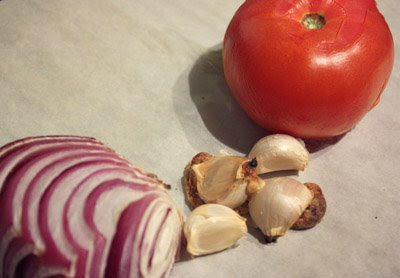 Place in an oiled bowl, cover with a towel, and let rise for an hour or longer. So, my process is: make dough, read a book or go to the gym or water the garden for an hour or two, then punch down dough, knead it a few times, and let it rest while prepping the toppings and heating the oven to 475. Then, the creativity begins. Sometimes, the dough is used for one big baking sheet-sized rectangle of pizza. Other times, I divide it into smaller rounds which are baked individually on a stone. There are no limits to the realm of possibilities for toppings. 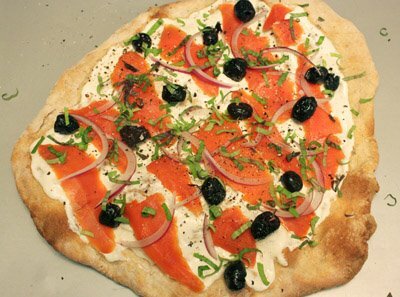 Yesterday, I took inspiration from Jacques Pepin’s Chez Jacques for a smoked salmon pizza. This is found in the Tortilla Pizzas section. Obviously, I didn’t use a tortilla for the crust, but I did opt for the smaller round of dough baked on the stone. 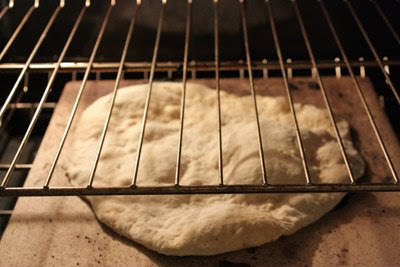 A tortilla sounds like a great idea for a really quick pizza, but I think it would be extremely thin and unwieldy. This section in the book also includes directions for curing your own salmon, but here I took the easy way out and used store-bought, wild sockeye, smoked salmon. The pizza was excellent. 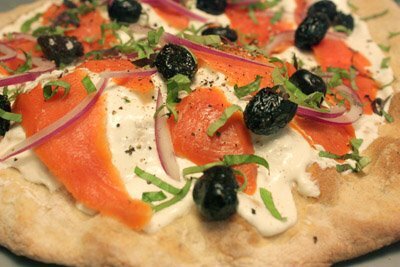 Crispy, thin, whole wheat crust capably supported the cool, salty, pungent, delicious toppings. The horseradish with the salmon and then the bite of the olive; well, it was so very good. It occurred to me that this would make great party food. 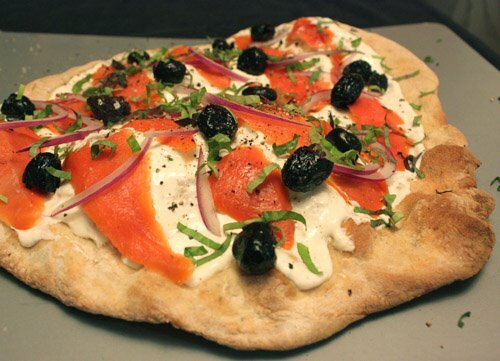 The pizza could be assembled, cut into bite-sized pieces in advance, and kept chilled. What happened with the remaining pizza dough? Two other creations followed. First, parmigiana with basil, Aleppo pepper, olive oil, and sea salt. 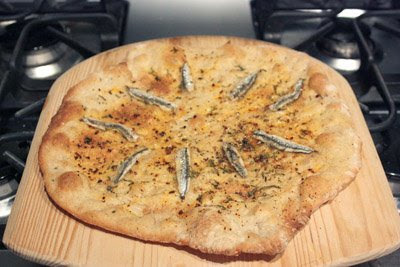 Then, anchovy, olive oil, rosemary, and Aleppo pepper. Both of these were delicious, but the smoked salmon pizza was the star of the show. This parade of pizzas filled our evening with a lot of crunchy, savory, contented eating. 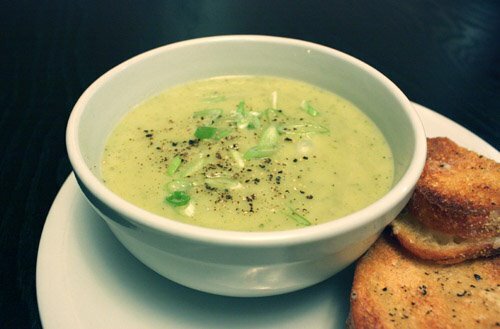 Potato leek soup can be excellent, or it can be so so and a little heavy. It can be served hot or cold. So many options. This rendition included zucchini, was excellent, and was served warm. 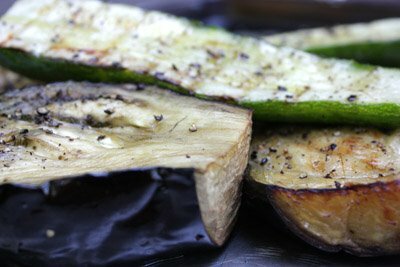 Adding zucchini to the mix was an inspired approach. 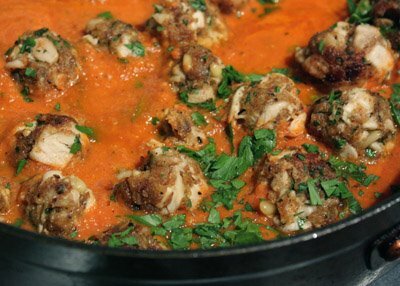 The recipe is found in Barefoot in Paris by Ina Garten. 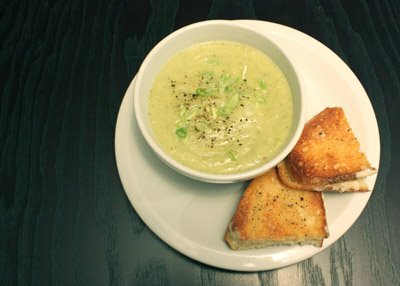 The instructions suggest passing the soup through a food mill to puree. I really think a blender is the way to go here. The smoothness you get from blender pureeing is ideal. And then, there’s the zucchini. 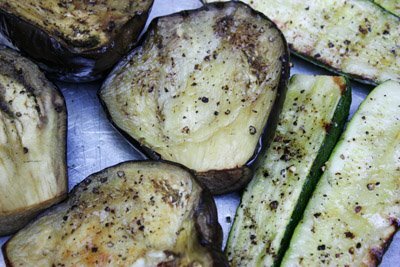 Including it did a couple of things that were very tricky of that zucchini. It made the soup less dense and the texture very silky. I even omitted the bit of cream that is to be added after pureeing because the soup was already so smooth and delicious just as it was. 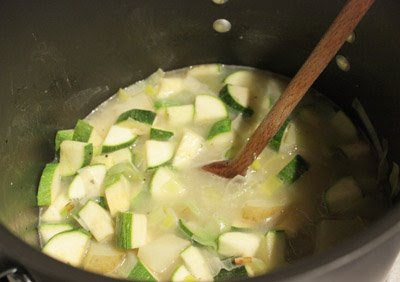 The mild zucchini complemented the potatoes and leeks nicely, and the consistency was perfect. I’m not a huge fan of chilled soups, so I can’t offer any comments on it in a chilled state, but it did re-heat beautifully for lunch the next day. I can also highly recommend a grilled cheese sandwich on the side made with sharp white cheddar. What’s a summery, light, lovely meal with exciting, surprising flavor? Look no further. This is it. This is a gold medal summer meal. The first taste of this brought on the (eye-popping, smiling while chewing, can’t talk yet, but when I can I’ll start waxing poetic about this) look that I get when I know some food thing has worked out really well. It’s the simple things that always really impress. Perhaps that’s because they catch me off-guard. This comes from the salt and pepper chapter of Donna Hay’s Flavors . 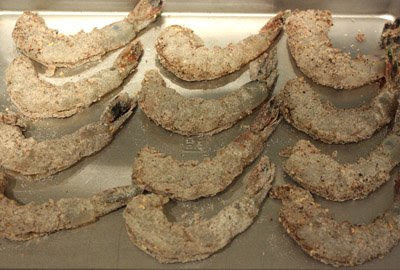 I used some really fresh and perfect, wild caught, gulf, white shrimp at a U10-15 size. Szechwan peppercorns, cyprus flake sea salt, and rice flour were pulverized together in a spice grinder. The cleaned shrimp were then dusted with the mixture. They spent a scant couple of minutes in hot oil and came out just beautiful with a very thin, crisp coating. 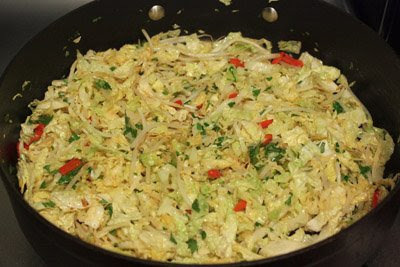 The stir fried bean sprouts went just as quickly in and out of a sauté pan along with sesame oil, savoy cabbage, chiles, lime juice, and soy sauce. I’m still thinking about the flavors as they came together. 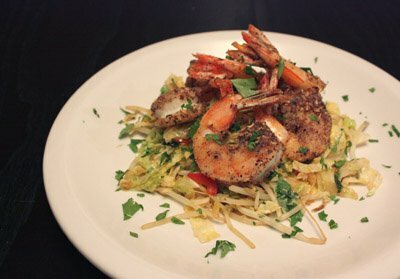 The sweetness of the shrimp played off that of the cabbage. The mild piquancy of the Szechwan pepper didn’t overwhelm, and the chiles in the stir fry were a nice additional touch of heat. 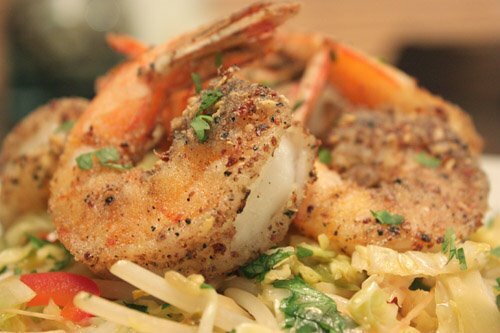 And, somewhere in the shrimp, there was a very subtle note of lemon. I’ve read that some sea salts offer hints of citrus, but I didn’t notice that when I tasted the cyprus sea salt by itself. It came forward though when combined with the pepper and the shrimp. A lot of the credit does belong to the shrimp because it was so fresh and plump and exactly like it should be. Well, there I go with the musings. Try this meal, and you’ll be musing too. If you’re wondering: what beverage would you pair with a meal like this? You’re in luck, because we conducted another wheat beer tasting and found one to be a very good match for this. This time, we tasted Ommegang Witte Ale which was crisp and refreshing with a touch of acidity. I happen to enjoy crisp beers with shrimp, and this one was extremely quaffable. It scored very high marks, and we may have to ponder a change to our top three favorites. This could appear as a tie for number two after further consideration. 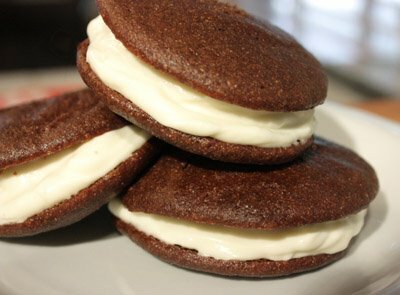 I thought people knew about whoopie pies. I don’t know the origin of the name, but I’d heard of them. 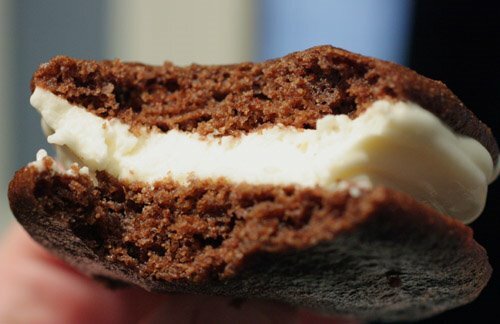 And so, I came trotting into work with a box full of them and offered them around only to be asked repeatedly: what’s a whoopie pie? Fortunately, everyone's confusion turned to bliss after tasting them. 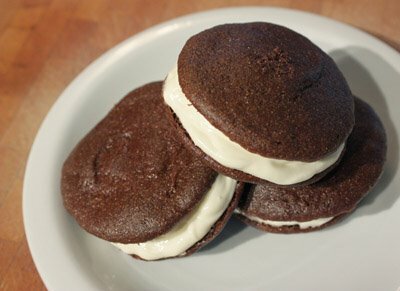 These particular whoopie pies are a lighter version than usual. I’ve been seeking out some light options during the summer heat, and when I stumbled upon this in Eating Well, it was a go. 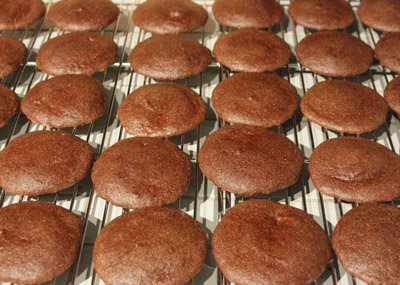 The cake batter-like mixture for the cookies comes together quickly and easily. 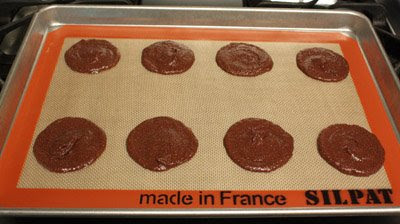 When spreading the batter onto the baking sheet, you do need to take a moment to try for evenly sized circles. In the end, some of my cookies were a tiny bit bigger than others, but they all seemed to find a mate of equal size for the sandwiching step. This recipe requires no butter and only one egg. The cookies are cakey, soft, and delicious. The filling with yogurt, cream, and vanilla has a sense of lightness about it but no lack of flavor. Everyone who tasted one agreed that these do not taste like anything is missing. Another bonus is that this is a very good chilled cookie. I usually prefer cookies at room temperature, but these need to be refrigerated because of the filling. The fact that they’re chilled takes them in an ice cream sandwich direction which is a very good thing. Coming to think of it, they would probably be fantastic frozen. They look decadent, and seem like a big serving of cookie, but they’re very light and nicely flavored without being too rich. 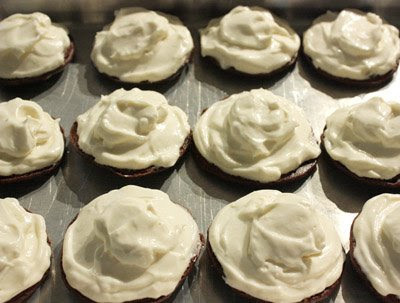 So, make some whoopie pies because the name is ridiculous to say, they’re easy to make, and they’re amazing to eat. Recently, I’d become bored with the lunches I bring to work and a change was needed. 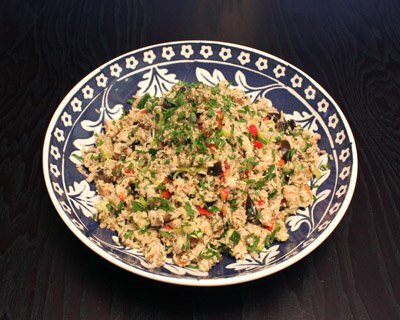 So, while trying to imagine something new and different that would be easy to pack and then heat in a microwave or eat cold, I came upon the rice salad article by Bittman. 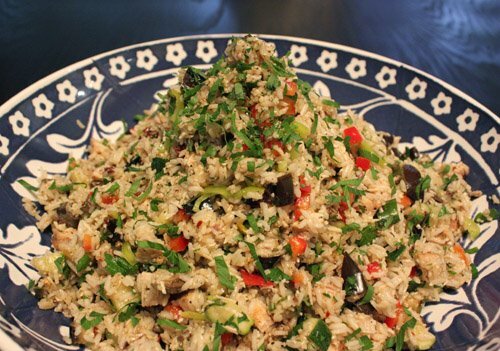 Rice salad is perfect for lunch at work, and it’s versatile. 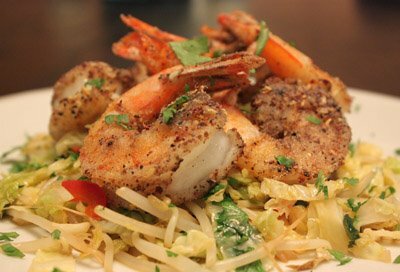 As explained in the article, you can turn any combination of ingredients that classically go together into a rice salad. Just pick a general flavor direction. Bittman wrote: "I’m not saying anything goes, but just about." First, I whisked the vinaigrette in a large mixing bowl (mustard, vinegar, oil) then everything else went in and was tossed to combine. Yield: dinner and lunch the next day for one army. It makes quite a lot. The grill smoke was a nice addition to the overall flavor. 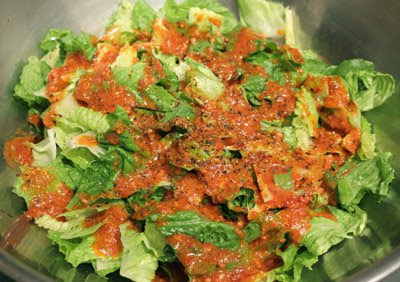 The salad was delicious right after being made. It was even better straight from the refrigerator for lunch the next day as some magic occurred while everything had nestled together overnight. I’m already thinking up other combinations and actually looking forward to future lunches. 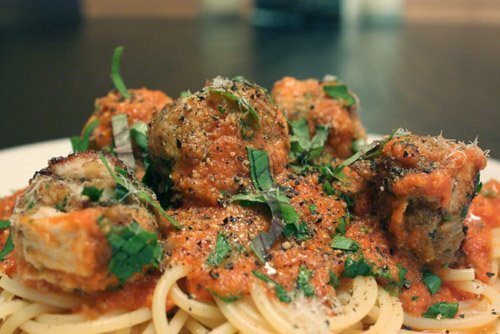 Or, 'the best tuna meatballs.' In the last couple of weeks, pasta with tuna kept coming to my attention, and I developed a craving for it. This dish comes from Jamie's Italy which is a great book. He writes that he saw these made in Sicily with a combination of swordfish and tuna. The Sicilian influence is evident, I suppose, with the addition of cinnamon. 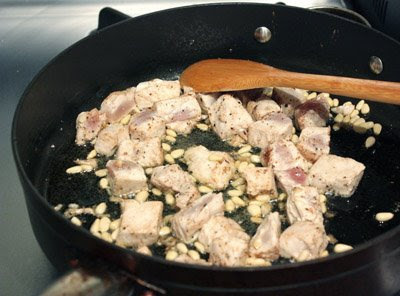 Fresh tuna is used rather than canned, but it is cooked first with pine nuts and cinnamon and then mixed with lemon juice, zest, breadcrumbs, grated parmigiana, oregano, parsley, and eggs. 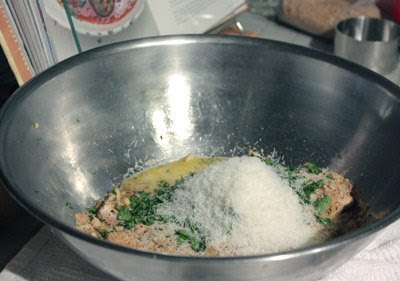 The mixture is formed into meatballs just smaller than a golf ball. Then, they are browned in olive oil and added to the tomato sauce. It smelled delicious as it cooked, and I tasted crumbled bits of the meatballs as I removed them from the olive oil. The flavor of those little pieces was very good. However, when we sat down to full plates, we quickly realized that the lemon was slightly too present and the tuna was somewhat lost. I would make a few changes next time around. First, I always use homemade breadcrumbs which come from whole grain breads. In this case simple, white breadcrumbs would be better. Second, I would cut back on the lemon zest by about half. And, last, some crushed red pepper or cayenne added to the meatball mixture might be nice. I should have thought about the breadcrumbs being too wheaty, maybe the lemon I used was bigger than usual, and adding crushed red pepper might only have occurred to me because the flavor was off due to the first two issues. So, what do I know? 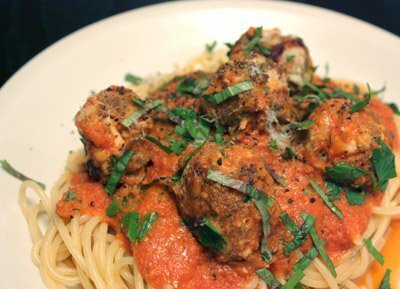 The tuna meatballs were much less heavy than even ground turkey or chicken ones tend to be, and the basic tomato sauce was very good. I would make this again with changes. But, I’m still interested in trying some other takes on pasta with tuna. I can say for certain that prior to preparing this I had never spent so much time on a fruit salad, but I don’t make a lot of fruit salads. This fetching concoction was the dessert of the month in Living in July/August 1999. I think the appearance of it alone made it worth the effort. 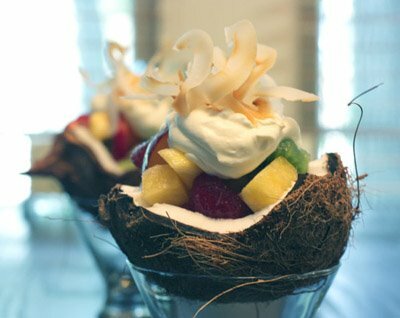 The coconut bowls are fun. In fact, I decided yesterday that my new favorite item in the produce department is the coconut. I was a little worried about working with the coconuts and wasn’t sure how much fighting it would take to poke their eyes and then bust them open. It actually wasn’t difficult. For each one, I used a pick and a hammer to make holes in the eyes, and I let the coconut juice drain out by setting it on a strainer over a measuring pitcher. 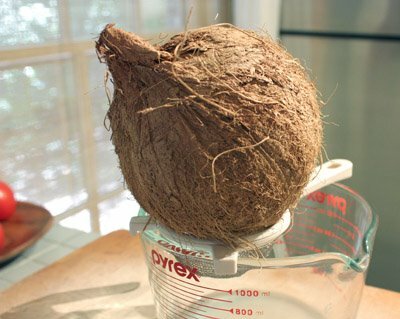 Then, I covered the coconut with a towel and whacked it with a hammer. When the coconuts are opened, their gorgeous color scheme is revealed. Bright, perfect white is surrounded by a dark, chocolate brown with a lighter, softer brown on the outside. And that is how I became enamored with the coconut. I plan to use this color scheme whenever and wherever I can. The remaining tasks in processing them were more tedious. The broken pieces were baked to cause the flesh to pull away from the shell. The shell was pulled off or pried off. The brown covering was peeled from the outside of the flesh, and the cleaned flesh was peeled into strips which were toasted. Moving on to the rest of the salad, I chose to use only half of the specified amount of sugar syrup. I prefer the taste of fruit without any added sugar, and the orange and pineapple delivered plenty of natural sweetness. However, because the sugar syrup was simmered with ginger, I wanted to include some for that flavor. The fruits I used were: orange, pineapple, papaya, pluot, kiwi, and strawberry. 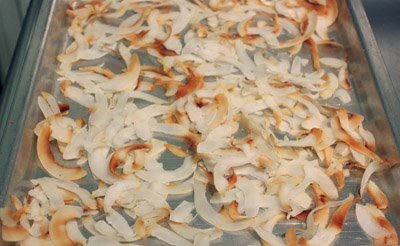 The recipe also calls for shredded sweetened coconut which I skipped. I’d like to point out that the flavor of fresh coconut is much, much better than the bagged, sweetened stuff. 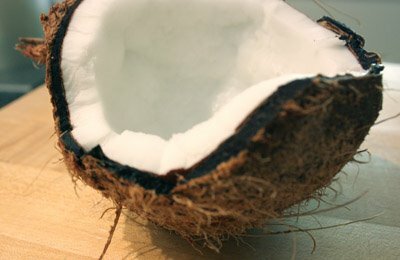 That cloying, whangy, coconutty thing is nowhere to be found in the mild, warm nuttiness of fresh coconut. The last item in the preparation is the whipped cream. Amaretto was to be added to the cream, but I had none so I used rum instead. Of course, I had rum. 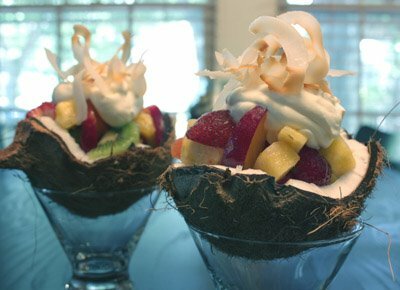 Just thinking about this combination of ginger, pineapple, lots of other fruit, fresh coconut, whipped cream, and rum provided a mental, tropical getaway. 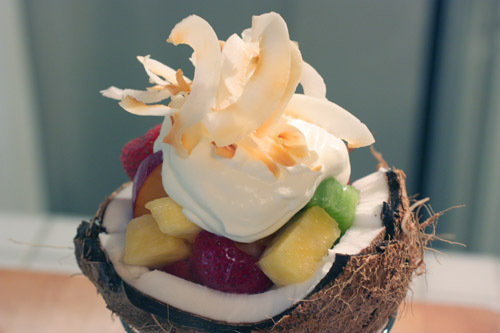 Eating that combination from a coconut bowl made me feel the sand between my toes. And, now I have left-over coconut juice and toasted, fresh coconut.